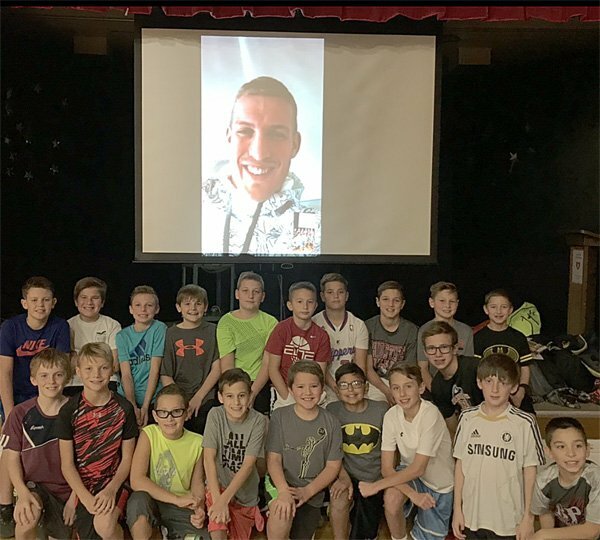 Former Winona Lake resident and current NBA player Mason Plumlee spent some time visiting with student-athletes at Sacred Heart School this week via FaceTime. Plumlee, who played for Duke University and was a member of the Blue Devils’ 2010 national championship in Indianapolis, spoke on what it takes to be a champion on and off the floor. Plumlee won three state titles at Christ School in Asheville, N.C., was 2009 North Carolina Mr. Basketball and a McDonald’s All-American. He currently plays for the Denver Nuggets. “I’ve been able to win championships at different levels. But the formula is the same,” Plumlee said to the students. “It takes many pieces to the puzzle, everyone has a role, and in order to win, each team member has to perform their role. Scorers need to score. Rebounders need to rebound. Questions were posed by Sacred Heart coach Colin Clemens, who was a teammate of Plumlee’s at Warsaw Community High School before Plumlee transferred out of state. Clemens asked Plumlee about what champions do when they’re not playing. “You’re not truly champions unless you do it the right way. Respecting teachers, coaches, parents, and your members of the community is of the utmost importance. I once had a teammate that broke team rules and he was suspended for five games, and it really hurt our team. Most don’t think of the consequences of their actions until they’re already in trouble.